At the ongoing MWC 2017, French company Alcatel introduced a 4G enabled 2-in-1 hybrid. Dubbed the Alcatel Plus 12, the company refers to the device as a laplet (LAPtop+TABlet). The Plus 2 sports an 11.6″ FHD IPS LCD powered by 1.1GHz Intel Celeron N3350 processor, 4GB RAM, 64GB storage (32GB eMMC+32GB microSD) expandable upto 128GB via microSD, 5MP front camera and a 6900mAh battery. Sporting a premium brush effect finish, there are multiple ports on the device which include USB Type C, USB Type A, micro-HDMI port and a 3.5mm audio jack. The entire package weighs just under a kilo at 990 grams. The device is aimed at business users which comes pre-installed with various productivity applications. 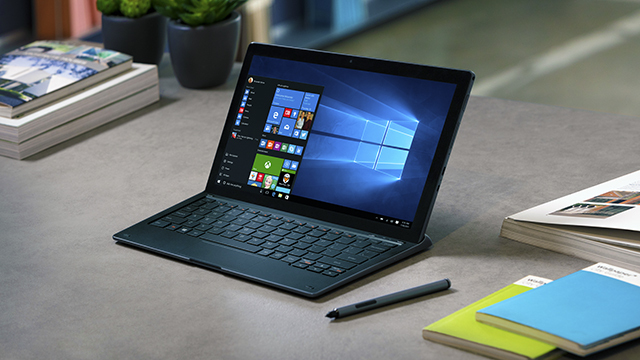 Running on Windows 10, it makes full use of features like Windows Hello biometric identification, Cortana AI for voice searches and Ink for jotting down notes and annotations. No word on a price or release date yet.